How often have you found yourself reading reviews of products? Moreover, how often have you brought that product based on the reviews that you read? The chance of you choosing and buying the product that has many reviews is high. This is a psychological phenomenon. In other words, it is called as social proof. A study claims that social proof works positively in many ways than intended. 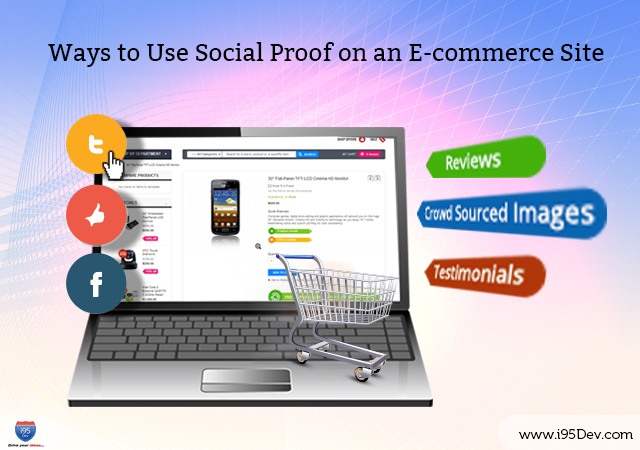 In this blog post, we shed light on the various advantages and ways of using social proof on an eCommerce website. A positive influence that is created when an individual assumes the actions of his peers in an effort to mirror behavior is known as social proof. For instance, if you are waiting for over an hour to get a table at a swanky restaurant, then it is assumed that the restaurant is good seeing the high demand. Social proof can be anything from reviews, number of shares, number of people checking in on social media, testimonials and number of users. Reviews: In the eCommerce industry, reviews and ratings are the best examples of social proofs. Ratings and reviews are known to build trust and increase sales. According to one research, 63% of consumers are more likely to purchase from a site if it has product ratings and review. To get more out of this consider showing a few great reviews at the top of the page. Crowd Sourced Images: Having a separate page for user submitted images has proved to be a highly successful tactic for a number of businesses. Encourage your customers to share your products used by them on social media by prominently displaying social share buttons on your product pages and website. Testimonials: Have a dedicated section that shows snippets of existing customer testimonials. Whenever a prospective customer clicks on these, a landing page should show the entire testimonial. This makes it easier for him to know about your service and the product itself. Sale Count: The number of items sold also makes a difference. Display the number of people who have bought the product or item and experience the rise in items sold. In addition, you can display the number of people who have placed said item on their wish list. Make sure you add this number only after a certain threshold is reached. Social Media: In today’s world of social media, displaying the number of people who, have shared your product page or, liked your page can increase the probability of that product being bought. Sold out: Many consider ‘sale count’ and ‘sold out’ to mean the same thing, they however, they have different purposes. While the former is just to indicate that certain amounts of items have been sold, the latter creates a ‘FOLO’ phenomenon in the consumer. ‘Fear of losing out’ can be used as social proof as well. Endorsements: If a celebrity or an expert in the field endorses your product, the chances of the sales of that particular item can increase drastically. Not only that product in particular, but your brand value also increases. Awards and Recognition: Displaying awards and recognitions can prove helpful especially if you are a just venturing out. In addition, this is a great way to attract B2B customers. Recognitions do not necessarily have to be from a reputed organization; they could also be as small as a “as seen on TV” label as well. Another great way to use social proof is by including trust seals in your landing pages. This instills a sense of confidence into your customers. Simultaneously, make sure that you assure your customers that their personal information (like Facebook name & profile, Twitter username) is safe with you and will not be made public unless you agree to do so. Each eCommerce sub-industry has its own techniques of using data and converting it as social proof. There is no hardbound rule as to only the ones mentioned above are considered as social proof. Anything that existing customers and/or prospective customers have done that can positively reflect your brand can be used as social proof and can assist the user in making an informed decision.